Discussion in 'iPhone Accessories' started by iphone2014, Apr 25, 2014. My iPhone 5 now has 100% working Qi wireless charging. I learned from Apple forum , but could not find the original post link now . So i make a conclusion here step by step. 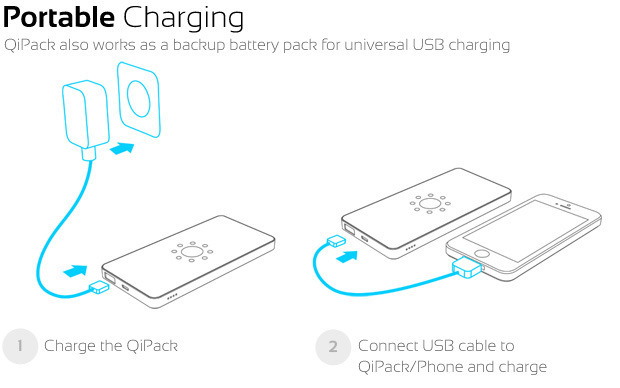 I used a wireless portable charger QiPack, a new power solution on kickstarter. The iPhone is working great, it's pure and complete wireless without cable or power wire. It will take 2hour 45 minuts for fully charging and almost charge 20% in half an hour. I have updated some pictures in case anyone else wants to attempt to DIY, simple 5 steps. PS: for first time use, you need charge the QiPack before using, because, there is a built-in 3000mAh li-ion battery pack in QiPack. 5.place iPhone to QiPack and click the on/off button for wireless charging. You still need to use cables to charge the charging pad though, so that 'after' shot will only look like that for two full charges. It will look just like the 'before' shot when you need to charge the Qi pad. As always the benefits are overblown. Thats a pretty good Fauxnews trick there. Take a picture of crazy wires then without any and people believe the charging pad charges itself. Hi matt, due to QiPack built-in 3000mAh rechargeable li-ion battery, it can provide both wireless charging and USB external portable charger. Right, I understand, but what I'm saying is that you still NEED to use cables to charge the qipack battery. So you can only charge without cables for two full charges. After that you need to use a cable to recharge the qipack. So the 'after' shot there is very misleading, because one third of the time you'll actually need to use cables. FYI - I'm still interested in this product but I would keep the charging pad plugged in all the time, so that all you ever have to do to charge the phone is lay it on the pad. That seems to be the real benefit to me. This no cables angle is just marketing rubbish; it's almost dishonest. Matt, In fact the kickstarter page had indicated to charge before usage, as the image shown below. Also you can contact the project creator for a confirmation. The video says that you can charge your phone and the Qi pack at the same time by leaving it plugged in, then remove the cable once the Qi pack is fully charged. That's how I would use it. You still need to use wires to charge using this thing - make no mistake. The benefit is in not having to connect a cable to your phone. I just bought a qi receiver pad for my iphone 5s. I plan on doing what the OP did and simply plug it in and then wrap it around with a case over it. Ill report back to say how it went. The kickstarter page indicate, there is 3000mAh built-in battery in QiPack, once fully charged, you can power iPhone without any cable and wire. Is there any battery built-in your Qi pad? if no, you Qi pad need to connect the power adaptor for wireless charging. No, the Qi pad I have is the one i got from AT&T for a very good price. I just received the receiver today. First of all, its very thin and fits perfectly between the case im using and my iphone. It also works very well and charges about the same speed as the cable. Honestly, I love it. Makes using and charging the phone that much nicer. Definitely would buy again. I am glad to hear that. Next time you can try QiPack. It works completed cordless and wireless with your iPhone. Cool concept but too bad I rock my iphone naked. I had the powermat for my 3GS and this is exactly how it worked. It also provided a very durable and protective although bulky case. Yeah. How dare this guy not invent a battery than can charge itself without being plugged into an external power source. WTF right? I think he was merely pointing out that the pics aren't exactly accurate since you will need A cable to charge the station. People who aren't very familiar with this might assume that you will never need a cable again especially based on these two pics. You missed my point entirely; beaver got it. Yes, Powermat is PMA standard, which QiPack is WPC Qi standard. Enjoy. No idea what the difference here is but for "wireless charging" purposes they are exactly the same. You put your phone in a case and set it on the charging device. Yes, but the battery in the QiPack has to be charged somehow or it can't charge the phone. So you are still using wires to charge the QiPack at some point. If you were not all that familiar with technology then it could be easy to misunderstand this and assume you would never use wires again. Difference, Magnetic Induction (MI) by WPC and Magnetic Resonant (MR) by PMA, and they not compatible with each other. Yes, the built-in battery of QiPack need to charged before usage, after that, you can use your QiPack power up your iPhone wireless/cordless. How many times can you charge your phone before you have to recharge the QiPack? Or after charging the QiPack once you can recharge your phone indefinitely? By wireless charging i can charge my iPhone5 1.1 times. By USB charging, i can charger iPhone5 1.8 times. It's quite enough for emergency usage. But your thread title says it is complete wireless and you are saying good bye to cables not you can charge without cables for emergency uses. It is a bit misleading. Again, this mainly applies to people who are not really familiar with technology in general. I can see my gf reading this thread title seeing your pics and assuming she will never need a cable again. If it serves your purposes then I am very happy for you.